I'm taking a class on patternreview.com called Clone Your Favorite Garment with Kenneth King. Last night was the first chat and I have to tell you, this class is fantastic. KK has a great sense of humor which doesn't come out clearly on a chat board, unfortunately. Anyway, I've picked a blouse that has never fit me well and I want to alter it to fit better, because it's really cute. Now that I'm doing the actual copying, I'm regretting picking a garment with 9 pattern pieces. That's a lot of copying. Today I'll be thread tracing all my grainlines and seamlines. You who know me know that that's a lot of hand sewing for someone who hates to hand sew. I'm still a little confused about how to handle the bust gathers, but I asked KK last night and he explained it. I'm just waiting now for Deepika to post the chat transcripts so I can go over carefully what KK said to do. I can see this blouse in a sleeveless and long sleeved version. I have so many wovens in my stash and very few patterns to use on them. I'm really looking forward to getting this pattern made and then altered to fit. 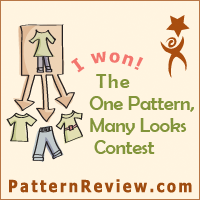 9 pattern pieces is a lot, but they all come together in a flattering way. I think you'll be happy with your pattern! Sthis is what I love about bloggsters. Giving us your take on al types of sewing ventures. I took an online class, a patternmaking class, and enjoyed it, although I didn't really have the time to invest then. I am very interested in taking a class from PR, so I'm anxious to hear how you liked it. Keep us posted! I saw this class on PR but felt I couldn't commit at the time. Keep us posted on how it goes. Sounds interesting and I would love to take class from KK. Like everyone else, I have wondered about the classes on PR. I can't wait to hear your opinion on the class and how your project turns out. I love a challenge! I'm sure you'll do great! Wow, that sounds like a great class!! Good luck on your blouse. Oh I wish I'd seen that class. I've got some things I've bought since I hadn't been sewing that actually fit so well. I hope he does this again soon. I'm eager to follow along with you on how this goes.